Regardless of whether you choose ESSBOX Original, ESSBOX Mini or ESSBOX Systainer, your workday will be greatly simplified. 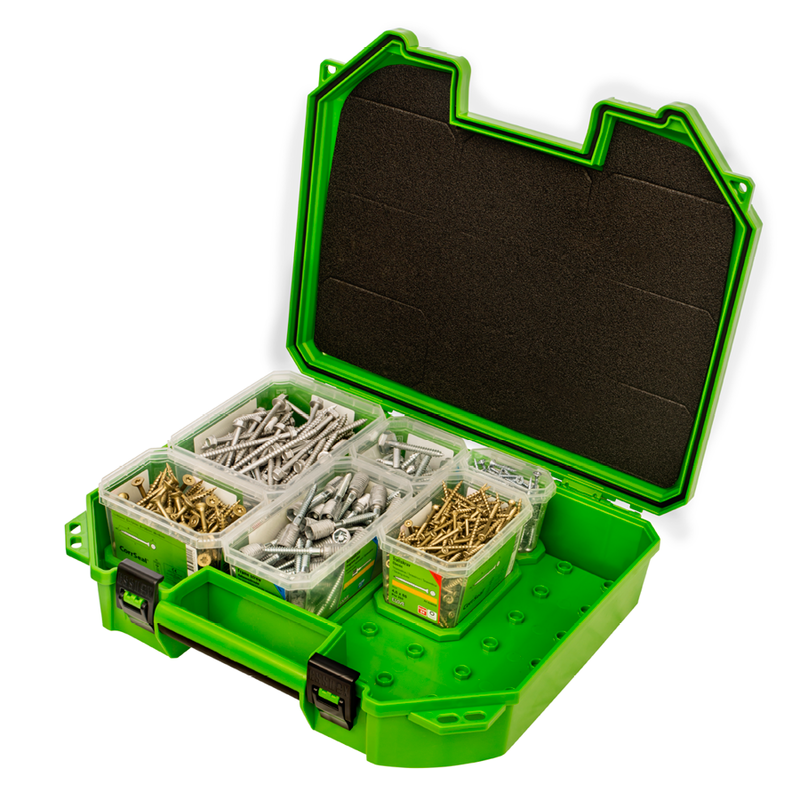 The secret behind the ESSBOX system is the integrated approach to the professional user’s everyday challenge: how to carry around a full day’s worth of fasteners in an organized way. The ESSBOX system helps the user quickly find and grab the right product for each task, without wasting time or material. 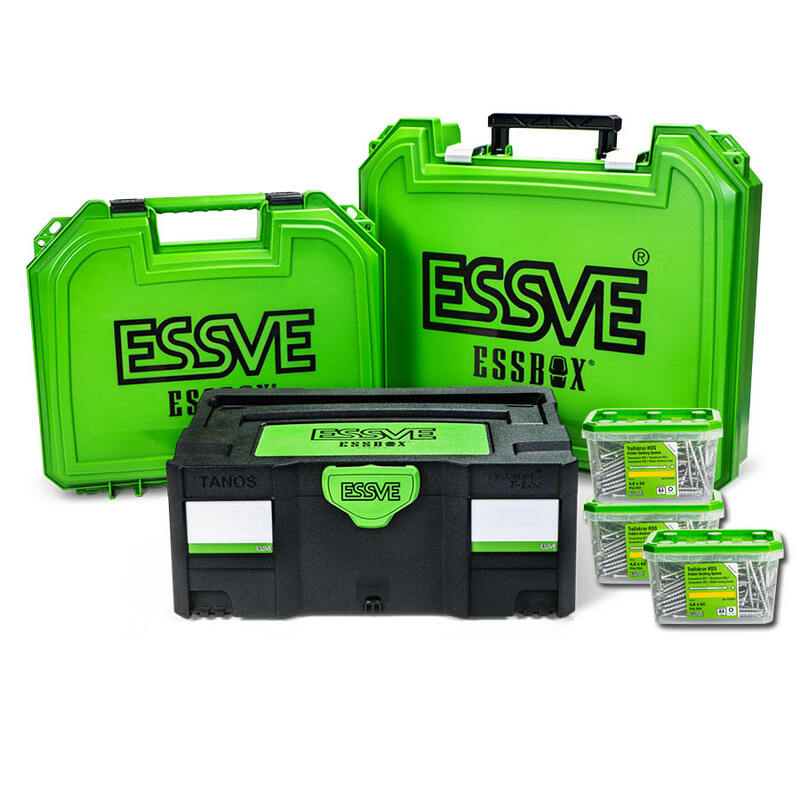 ESSVE offers one of the industry’s most comprehensive ranges within premium fastener and fixing: more than 5,000 products, including 1,500 screws, 1,900 fasteners and fixers, 650 nails, 400 adhesives and more than 800 other fastener-related products. Almost all products can be loaded into the case directly, still in the transparent product boxes they are sold in making it easy to load the ESSBOX case with exactly what’s needed for any given job. The rest of the products can be fitted by using a foam pad and cutting out silhouettes for the items that don’t come in the transparent product boxes – power tools and cords, bottles and tubes, adapters, drill bits, or anything else. Most users prefer to load the product boxes into the cases with the lids off, so they can immediately see what’s inside each box and can grab what they need. That’s why the boxes have the same snaps both in the bottom and in the lid, so the loose lids attach to the bottom of the case with the boxes on top of them. A foam layer in the lid of the closed case then keeps the contents of each box in place, even when the case is shaken or turned upside down. 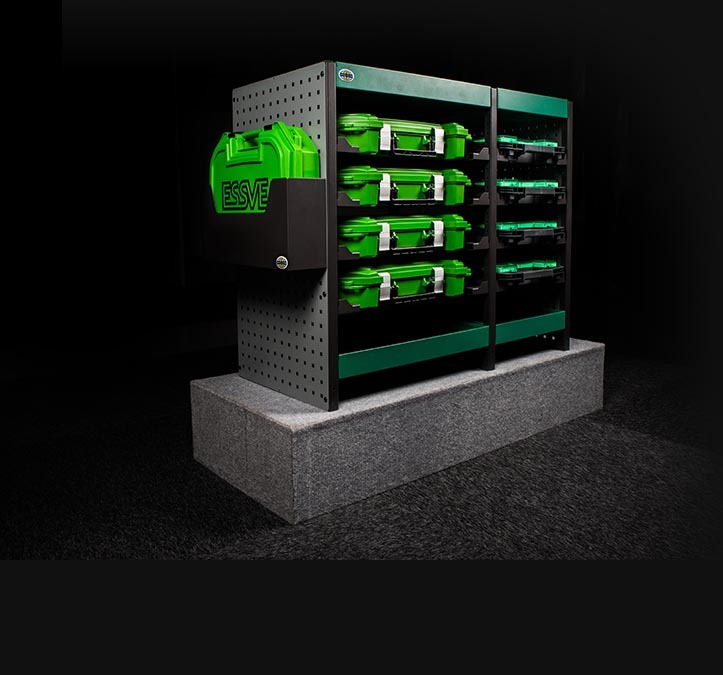 ESSBOX is an integrated fastener system that perfectly illustrates our core philosophy: Working close to professional users results in ground-breaking designs that streamline their working day. The idea of ESSBOX was born in ESSVE’s test pilot program, where we involve industry professionals in R&D for new products. The project’s analysis found that half of all professional construction workers did not use all the products they bought and 90% of the respondents interrupt their workflow in order to find the right fastener. As many as 95% reported that they had problems with broken product boxes and spilled products. We saw a big need for a system that could create order and clarify, simplify and streamline the professional user’s work and minimize spillage. The result was ESSBOX System. Today, just five years after launching, half of all professionals in ESSVE’s home markets, Sweden and Norway, have switched to using ESSBOX! For our distributors, the system creates exceptional customer loyalty, which in turn leads to continuous sales and guaranteed growth. 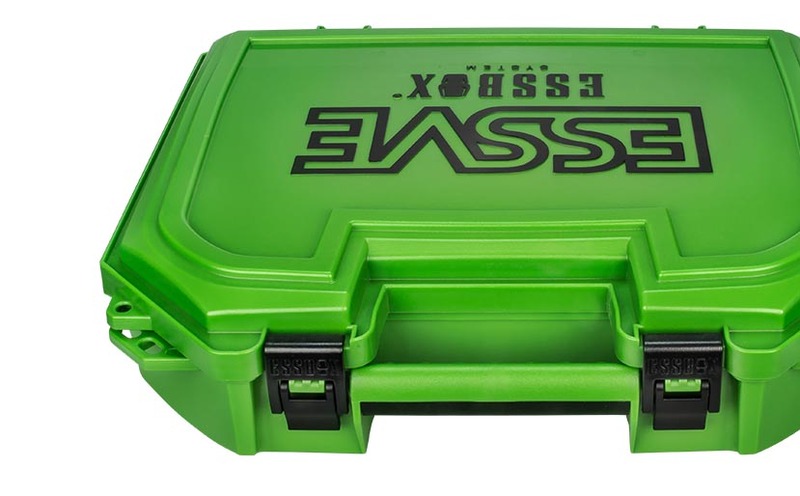 Make sure you stay organised at all times by using car racks and vehicle interiors fit for ESSBOX System. Our products fit most of the existing solutions available on the market.